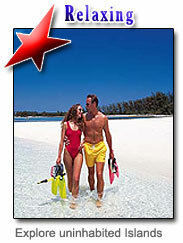 Let my lovely wife Barbara and I take you on a private cruise through the Caribbean in comfort. 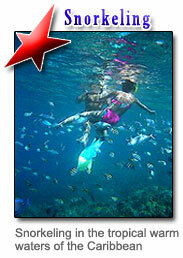 Lie at anchor in one tranquil bay after another, as sea turtles surround you basking in the sun. Work on your tan lines while reclining on one of our floating mats. Let the clear waters refresh your spirit while the gentle tradewinds melt away the stress. Barbara and I (Captain Harry) have a passion for chartering in paradise. We would be delighted to have you onboard our 75 foot Formosa Primadonna 2. Maybe you'll just want to soak up the sun while enjoying a cool drink and views from the cockpit as our professional crew prepares an al fresco lunch to be served beneath the shade of the bimini. 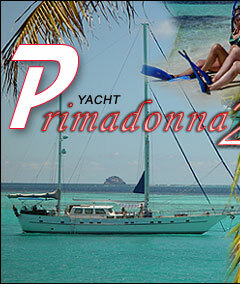 Step aboard "Primadonna 2" and experience the most spectacular vacation of your life. This magnificent 78-foot private yacht is one of the finest in the Caribbean and offers a host of amenities not found anywhere else - at any price. A yacht charter is a step above your average vacation rental property. With the sea by your side and beaches on your doorstep, you really are at the heart of a fantastic holiday experience. Click here for other amazing vacation ideas. Primadonna 2 is everything you'd expect from a five-star resort - plus so much more. She comfortably accommodates up to 8 guests (12 guests for families) in 4 equal, air-conditioned staterooms - all with private baths. Dine alfresco around the spcious cockpit table, or entertain in elegant style in the immense salon and bar area. Whatever your wishes from formal to laid-back, your expert crew will be at your beck and call to make sure your time aboard Primadonna will be unforgettable. Spend your next holiday with us, and we'll show you firsthand why Primadonna 2 is truly "The best value in the Caribbean"
Meals and cocktails aboard Primadonna 2 are truly remarkable. Your masterful chef is trained to accommodate just about every food request you might have - including any special restrictive dietary requirements. 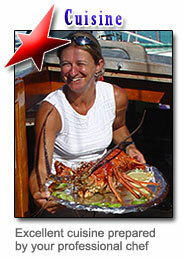 We strive to ensure that each meal aboard Primadonna 2 will be a memorable one.